I've been playing on a very cheap Chinese trade Fiddle now for about 5 months, cost me about $90 bucks total. It has a rather whiney "echoey" sound and came to me with really high action and a terrible set-up. I've since filed the bridge down flattened it ( I'm an aspiring Bluegrass Fiddler ) and also filed the nut and actually widened the string spacing at the nut. Since then the Fiddle has been doable, but after 5 months I've been ready to upgrade. My research led me to pull the trigger on 2 Carbon Fiber bows and a Romanian Gliga Trade Fiddle. 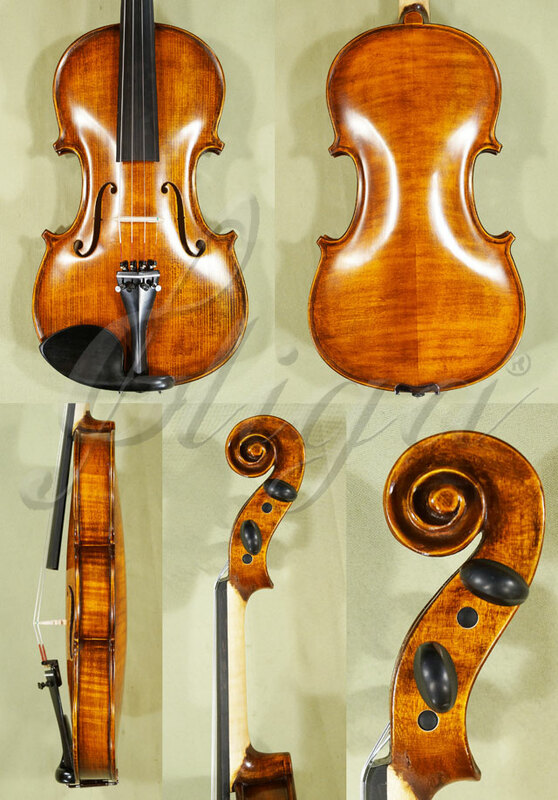 I paid $350 and purchased the Gliga Genial "1" Student Violin that has an antiqued Oil finish. It has the look of a much more expensive Fiddle however I won't be accepting delivery on the Fiddle here in Argentina until October. I've played on quite a few. Was considering selling them at Fiddlershop. The one thing I can honestly say about them is that they are beautiful instruments. A friend owns one and it sounds nice. Hi and welcome to the forum, @BluegrassFiddle. I agree with FM that Gliga violins are beautiful instruments. And yes they are on the 'mellow' side by using thick/soft bridge and setup. I own 2 of the pro line ones (Guarneri copies), second from their top Maestro ( which is not much different beside finishing). One could retone it by tuning/replacing its bridge and soundpost, but that is lot of works, also the top plate tends to have wolf tone very easily if not tune/setup correctly (I fought with those for quite a few months myself). Projection and brightness are not really considered in their entry/student lines of violins. Those two of mine are now at my 3rd and 4th choices, as my Maggini and Stainer copies (which are very old/fairly well made) are my most favorite. My suggestion is that when you need a violin with such character/sounding for your playing style/genre, consult FM/Pierre and he can select a violin that fit your requirement and it's economically attainable. And again, welcome to our forum. I play a Gliga Gems 1. I got it, a bow, and a case about 7 years ago for 400 dollars. It is the best fiddle I've ever owned. It has a powerful, mellow (woody) sound. It is made nicely. Looks like a much more expensive instrument. The only flaw I find is on the D string in 3rd position... the B and C and D notes require harder work to make sound good. It's not exactly a Wolf tone but it is very noticeable. The string doesn't seem to want to respond to the bow there. That could be the string itself I guess. All in all I'm glad I got my Gliga. There's a shop near where I live that sells Gligas. There are those that don't like what they call the "clunky Romanian corners," but I think they look fine. I've played a few of them in the $750-$1500 range and they sounded like decent fiddles to me. I'm sure you could get it to sound good for BG and old time. Most old-time and bluegrass players use steel core strings to get a brighter fiddle tone, whereas classical players are more apt to use synthetic core strings for a warmer sound. I imagine with good quality steel core strings it would sound pretty nice. The only flaw I find is on the D string in 3rd position... the B and C and D notes require harder work to make sound good. It's not exactly a Wolf tone but it is very noticeable. The string doesn't seem to want to respond to the bow there. Yes, @uncledave, B, C and D notes have little problem, and you're right that it's not exactly wolf tones, but they're entering the wolf zone, very fuzzy and not defined/clear at all. If you use some recording software that display sound amplitude, you will see that those notes are suddenly having larger wave forms comparing to the rest. Check those notes on G string to see. Mine is worst at around C on G string, noticeable on other strings as well. What happened was that those frequencies vibrate the violin body co-sympathetic resonances, hence the increased amplitude. Solution could be dampen the top, G and D afterlength, at the cost of changing sound color and timbre. My solution was to replace the stock 6mm soundpost with a larger one, 7mm and relocate the soundpost to a location that minimize those effects, by reducing top plate free/unwanted vibration, but it took a while to get it fairly under control, still there but just not very pronounced. Thanks for the info! Would a "Wolf Eliminator" help? I don't have the nerve to mess with my sound post and the nearest luthier is over 100 miles away. Yes, @uncledave. Wolf Eliminator will reduce those unwanted/extra frequencies which interfere with the notes frequencies (hence the fuzzy/unclear tone/pitch, as there are two sort of frequencies going on at the same time, notes pitches/frequencies and the violin body/top natural resonance frequencies. Good makers would tune those natural body frequencies outside of the usable notes frequencies to minimize/avoid interferences), but at the cost of changing sound timbre and color. Wolf Eliminator is sometimes unavoidable on larger string instruments, which prone to do so, ie cello and so on. For violin, wolf zone has a bit less effect, but still very annoying, if you know what I mean. LOL, just can't get the note right. Wolf eliminator is basically just adding mass to critical vibration part of violin to reduce unwanted resonances, and you don't have to buy one of those things (the strongest one is heavy with metal construction, very similar to violin mute. The heavier it is the more it affects the sound). You can try just a rubber piece, like rubber pencil eraser. Cut a line in the middle and stick it in those offensive string afterlengths, closer to bridge equals more effect, less would be closer to tailpiece. Experiment with its size/mass, you may not need a lot to tame down that annoying thing. Wolf eliminator works the same way by introducing mass to string afterlength to reduce vibration (same as violin mute to sound level). Another solution is introducing mass to top plate, behind bridge at around G, D string areas by using strong magnetic pieces on both side of top plate, but it's not very elegant for violin. So just with a couple of those rubber pieces (or heavier material if you wish), you can work it out. Don't waste your money on one of those Wolf Eliminators. Again, experimenting with the size/mass, too much will loose the violin timbre and color so do it as little as you can (I fought with this issue for quite a few months with quite a few bits of things). Good luck, @uncledave, and it's very impressive that a fairly new player noticed these things (took me a year or so before I knew that my violin was acting funny at those notes). Thanks! I'll start experimenting tomorrow. Fiddlerman: You mentioned you thought they "were beautiful violins" but you never ended up carrying them in your store. Was their something about them that gave you the inclination to not want to sell them in-house? By "wolf-Tones" I suppose your meaning "overtones" if I'm not mistaken. My current fiddle sounds very echoey when I play on the "E" string, especially up the neck. It almost has a hollow "metallic" kind of tone to it. Where I live in Argentina, it was the only Violin I could get, not to mention no luthiers nearby. I paid the equivalent of about $90/US dollars for it. It has a solid, but pressed top, but the back and sides seem literally like Blasa wood LOL! So, I had to watch, read and learn to do my own set up on it basically. I filed the nut down to lower the action at the nut and also filed the top of the bridge and flattened it quite a bit for folk and bluegrass playing. It helped quite a bit as it's much more comfortable to play now. I also widened the string spacing at the nut a bit and re-slotted it. The sound post "seems" correctly positioned just behind the bridge on the treble side...I compared it to photos and diagrams of where it's supposed to be positioned and it seems to be in the right place. It does have a VERY soft Maple wood bridge though. I'm sure it isn't a top-notch set-up job that I did, but it stays in tune and plays fairly comfortably so I'll make due for now. I'm not afraid to experiment on my instruments. The more I know, the more independent I can be in doing things myself. My research led me to make the purchase on this Gliga Fiddle and I think I've got a decent "axe" for my level of skill and playing at this point, they came highly recommended. Even so, Bluegrass and Folk fiddlers can get by with much more inferior instruments than per say a classical, professional violinst where the musical demands are much greater. We don't have to have such projection to be heard over huge symphonies orchestras and in large concert halls. Besides I've heard that the real high quality, professional violins that professional classical violinists prefer are so loud and responsive, less qualified players would have a harder time taming and playing these violins....is this true? Seems to make sense to me. I think I've done well so far. In the future if I get ready to purchase a higher quality violin, maybe I can keep my new Gliga as a back-up and can consider a Fiddlerman violin as a real step up. I'm not afraid to experiment on my instruments. The more I know, the more independent I can be in doing things myself. My research led me to make the purchase on this Gliga Fiddle and I think I've got a decent "axe" for my level of skill and playing at this point, they came highly recommended. Even so, Bluegrass and Folk fiddlers can get by with much more inferior instruments than per say a classical, professional violinst where the musical demands are much greater. Agree that the Gliga will be a decent one, a real step up from your current fiddle, and it's a plus that you can do some setup/adjustments just in case needed or tune it to your taste and/or the genre/style of your music. Beside a little issue with fuzzy notes, mine are real nice, not the most favorite but still better than quite a few Strad copies that I have, and for sure that I won't be able to outgrow it any time soon, if ever. If yours is Strad model then you may not even have those wolf tone issues, as both @uncledave's and mine are Guarneri models (a bit larger in some physical dimensions, hence more powerful and darker tone and of course got a bit more complicated with setup and toning). Congrats on your new violin and I think you will be happy with it. Mine is a "Strad" style with the smaller upper bout. By the way you mentioned "Clubby Romanian Corners" what did you mean by that when you said that? Hurton that is a very beautiful Fiddle indeed! I'm hoping this Fiddle will last me a lifetime, if not as a primary instrument, a back-up fiddle at the very least. I say this because I certainly am hoping that I don't get VAS ( Violin Adquisition Syndrome ) because it can become a very expensive addiction indeed and besides, my wife definately would be none too happy. Those of you who are married with kids, I salute you, because you know exactly what I mean! Now I bought this Gliga based upon research, recommendations, reviews and word of mouth. It could be a real keeper, and it could be pure "crud" for all I know! Although, I'll be willing to bet it's a heck of alot better than what I'm bowing currently! Anything would be to be honest! My mom swears I paid over $1000 dollars for it, she's from Kentucky and say it looks "fancy" and actually got mad at me for buying it thinking I spent too much money on it! Plus it had the Oil finish which I like with the Antiqued look. They offered to play it over the phone but I don't know if that will do any good, can't hear much over a phone. So it was a $350 risk that I took and I pulled the trigger. After all, it fit nicely within my budget, and, I even saved money by ordering it with the case only, and no bow, knocked about $59 bucks off of the price right there. Now, some have told me Gliga's can have a bit thicker necks than normal Fiddles. Which, in turn, might work for me, the noodle neck that I have on my current Fiddle is soooo thin! Also I know, I guess some don't like the "squared corners of Romanina Violins either but I think they look nice. Either way China and Romania are building some pretty competitive stuff these days it would seem according to my reading. Seems like it's a "You'll get more bang for your buck than usual Violin buyer's market these days all around" am I wrong? 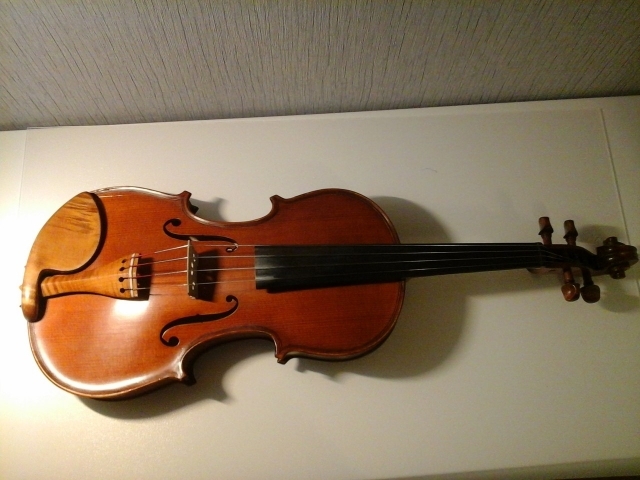 Very nice looking fiddle Hurton but I wonder if you have a crack by the edge on the back by the chin-rest? Fiddlerman, I noticed that as well on the bass side of the lower bout right?